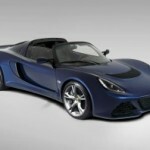 Lotus Cars – Get ready for the fastest ever Lotus convertible! Over a year after it’s first announcement at the Geneva Motor Show 2012, Lotus have released full details of the Exige S Roadster – the convertible version of the V6-engined Exige S.
This summer the critically acclaimed Lotus Exige S loses its roof and gains a new character. As capable as its coupé counterpart, the Exige S Roadster retains all the intent of a race-bred sports car but also possesses the poise of a sleek convertible. Sitting alongside the Exige S, Exige Cup and Exige Cup R, the Exige S Roadster completes the Exige line-up and enhances the track focussed collection by providing a new facet to the range. Powered by the same 3.5L V6 as the coupé variants and weighing in at 10kg less than the Exige S at 1166kg, none of the exhilarating performance of the phenomenal Exige range is compromised, yet the driver is only ‘two clicks and a roll’ away from cruising in open-top style thanks to the lightweight, factory-fitted soft top. Achieving 0-60 mph from standing in 3.8 seconds, delivering 345 hp at 7000 rpm (350 PS) and 295 lb ft of torque at 4500 rpm, the Roadster matches the coupé’s mechanical performance and retains its £52,900 price tag, but style takes an understated approach having shed its rear wing and front splitter to maximise airflow over its sleek silhouette. The introduction of the new Exige to the Lotus product range has provided a new opportunity for the Norfolk based sports car brand to expand and strengthen its production resource, generating new jobs and opportunities for skilled individuals who want to be part of the Lotus story. The Exige S Roadster is the perfect car for a ‘joy’ ride; what better way is there to enjoy the panoramic views of the world’s most beautiful roads than when they are enhanced by the purposeful roar of a V6 soundtrack and to feel the wind in your hair and sun on your skin? Exige S Roadster is now available to order with the full list of options and extras as available on the Exige S coupé, with the extra interior option of quilted leather seats and door trim details. Engine: Mid-mounted, transverse 3.5 litre DOHC V6 VVTi, 24-valve equipped with Harrop HTV 1320 Supercharger. Transmission: 6 speed manual with sports ratios only from launch. 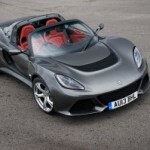 Paddle shift options for Exige S Roadster will be considered subject to demand. Suspension: Fully independent double wishbone suspension with front and rear anti-roll bar. Bilstein high performance gas dampers and Eibach coaxial springs. AP-Racing four-piston callipers with ventilated and cross drilled cast-iron discs. Motorsport variants are available at GBP rates only. The Exige Cup is priced from £52,495 for the base model and the Exige Cup R from £62,495 both pries excluded VAT, local taxes and on-road costs. Fuel consumption for Exige S is – urban 19.5 mpg – 14.5 litres / 100km, extra urban 37.2 mpg – 7.6 litres / 100km, combined – 28.0 mpg – 10.1 litres / 100km. CO2 emissions 236 g CO2 / km. 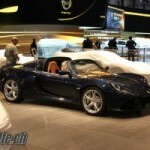 This entry was posted in Group Lotus and tagged Exige S Roadster, Exige V6, Lotus Cars, Press Release. Bookmark the permalink.